OPI's Soft Shades collection for 2013 (sent for review) is a set of three sheers, three glitters and one new Liquid Sand shade, all inspired by Disney's Oz The Great And Powerful. I don't plan on seeing the film since the original one still terrifies me, but the polishes are pretty much the opposite of traumatizing and nightmare-inducing. What? Come on. Don't try to tell me that the Wizard of Oz isn't scary. It is. ANYWAY. Soft Shades. OPI Don't Burst My Bubble. Sheer off-white. Has a clean look as if it has a touch of blue or violet in the base rather than a yellowed/antique look. This was a little streakier than the other two sheers but nothing terrible. 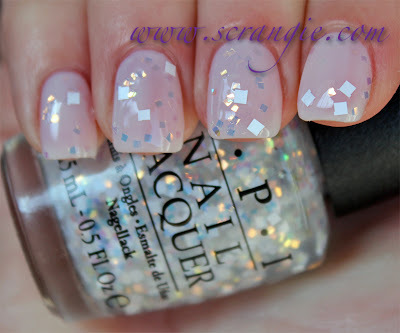 OPI Glints of Glinda. A sheer, mostly neutral beige creme. It's nice and sandy looking, not too strongly brown, too yellowy, or too pink, and light but not chalky or excessively white-ish. Very easy to wear. OPI I Theodora You. A light, neutral, sheer pink creme. More pink than white, but also has enough warmth in it to seem almost peach-colored in certain lights. Very nice glossy-thick finish to this one, almost a creamy/milky jelly finish. OPI Liquid Sand polish in What Wizardry Is This? This has a warm, dirty olive green shimmer base with glints of gold, bronze, brown, red and even a few flecks of blue. It dries to a sandpaper-like finish that's semi-matte. I let this one dry for an hour before taking the picture and it still has a bit of shine to it, but I've heard from many people that their Liquid Sand polishes turn completely matte after drying. 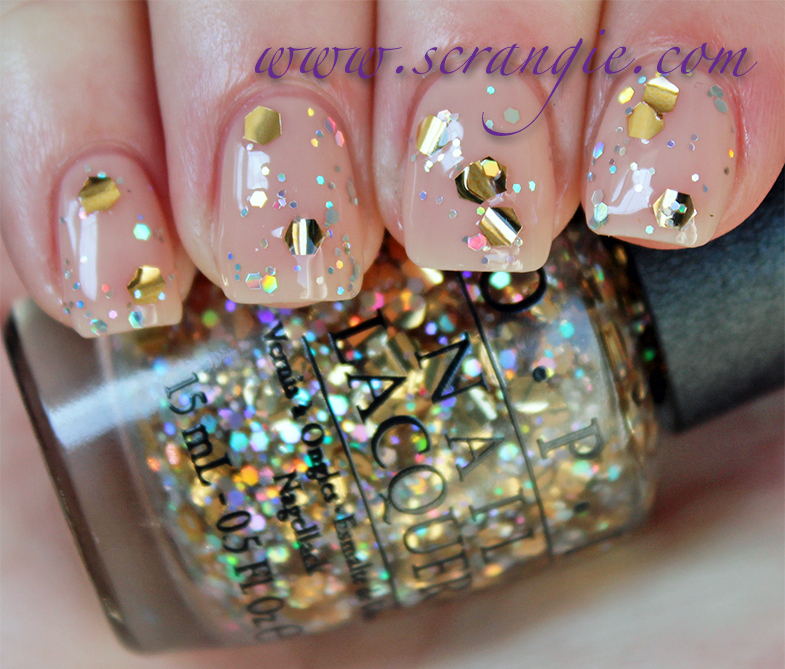 OPI Liquid Sand polish in What Wizardry Is This? with topcoat. I prefer it this way as the topcoat makes the multicolor particles stand out and sparkle instead of just looking textured. It needs at least two coats of topcoat to smooth out the sandy texture. OPI Lights of Emerald City (over OPI Don't Burst My Bubble). A clear base (with slight blue-ish tinge) with medium square opalescent mylar glitter and large pearlized white glitter squares. I love the idea of this glitter but not so much the execution. The clear base is very thick and gooey and the glitter is very sparse which makes it difficult to apply. You end up with thick, globby nails and barely any glitter. I'm going to thin this and see if it applies any easier, but I still think it could use just a touch more glitter in the base so more ends up on the nail. OPI Which is Witch (over OPI I Theodora You.) A clear base with silver hologram microglitter, medium silver and hologram hexagon glitter and tiny hologram bar glitter. This looks way more delicate on the nail than I thought it would from looking at it in the bottle. That's a good thing. It's the perfect bar-hex holo combo for layering because the pieces are so small and fine. It won't clump up or cover your base color in weird ways like larger hex and bar glitters usually do. The formula on the cremes was good, and the glitters were smooth but thick. The sheer cremes have a thicker texture than last year's Ballet soft shades and were a little streakier for me, but maintain that same self-levelling super-glossy quality that I liked about the others. I didn't have trouble with any shade except Lights of Emerald City, which was thick and goopy. Dry time on these is very fast. Pretty and delicate with a touch a glitter. Good for Spring or for office wear. I personally preferred the milky jelly look of the NYC Ballet Soft Shades (especially as a glitter sandwich), but these are still flattering and natural. They're neutral enough to be worn by a wide range of skin tones and they didn't give me a problem with streaking. The Liquid Sand finish still doesn't have my heart, but I love What Wizardry Is This? with topcoat. Also: awesome name. I have to recite it all dramatically every time I say it. What wizardry is THIS?? thank god i'm not the only one that never watched the wizard of oz as a kid. totally scary. great swatches! I really like this whole collection. BTW, I love the Wizard of Oz. The monkeys always scared me in the original. No joke. IRL, I find "I Theodora You" too pink for me, and "Don't Burst My Bubble" much nicer. As always, I love your swatches - you're usually my first stop to see if a swatch is available for a color! Well, I don't know. You have to feel sorry for some of the actors in the original. I'm pretty sure the witch actress got really badly burned from the fire exit scene thingy. Well, I don't know. You really have to feel sorry for the witch. I mean, all she wanted was the shoes, and the only magic they seem to have is transporting someone which she can already do. I really don't see the point to killing her, accidentally or otherwise. Which is Witch is really pretty! OPI When Monkeys Fly! Is a very cool glitter, I just can not get over those taco glitters. They look like they stick out even after numerous layers of topcoat. Am I the only one who doesn't see this collection as representative of the excitement of the Wizard of Oz??? I get the Glenda one and maybe the Flying Monkeys one (although there are many reports of the curling taco's) They already released the Ballet line which makes perfect sense to me and the formulas are supposed to be better. I love to layer but this collection seems not only uninteresting, but also uninspired. Geez, what about an emerald? I saw this movie a few days ago and it was AMAZING. I could see it again. These polishes are a great touch, they are very beautiful colors. I can see where the colors and names come from in the movie and I really hope to get my hands on this collection! The Wizard of Oz is *totally* scary! I had nightmares from watching it, I think I was six or seven at the time. But that didn't stop me from buying the complete collection (a first!). Anyway, WWiT doesn't dry down completely matte for me either. I love the texture, though, and love that I can add topcoat for a whole new look. Meh..not too impressed with these colors, they already did sheer polishes with the New York City Ballet Collection. Nothing I really need from this collection so this is a mus skip for me sadly. O well..can't wait to see the movie! Lights of Emerald City applied perfectly fine for me! 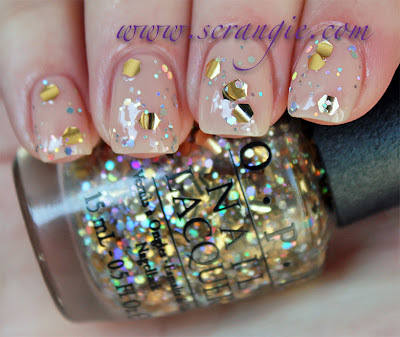 I'm surprised this review did not mention OPI's 'recall' of When Monkeys Fly due to the excessive glitter curling. I'm anxiously awaiting a Soft Shades collection that can rival the NYC Ballet Soft Shades. They were just so amazing. Ooh, I hadn't heard about the recall! Admittedly, I've been living under a rock for the past few months, but... I'm gonna go google it! My personal bottle is fine, but I can definitely see this glitter having a curling problem since it's so big. The bottles of When Monkeys Fly at my local beauty supply have glitters that are beyond taco-curl. It is like burrito-curl it is so bad. Lovely collection but I have to agree with you I kind of prefer the soft shades collection from last year... the NYC Ballet Collection. As a side note, I never found The Wizard of Oz scary but I always was TERRIFIED of The Return to Oz... now that was one creepy movie... I was probably too young to watch it in the fist place! There's really nothing in this collection that appeals to me. While "I Theodora You" and "Don't Burst My Bubble" are very pretty light pinks, they also seem super dupe-able (hehe, superdupeable! That sounds funny! lol!). I don't like really big, chunky glitters much either. I do like textured polish, but "What Wizardry Is This?" looks more like something I'd find in my sons potty than something I'd want on my nails (although, it does admittedly look better with a topcoat). If your not hooked on textured polish yet, I would recommend trying Zoya's Pixie Dust. It's different than OPI's Liquid Sand. 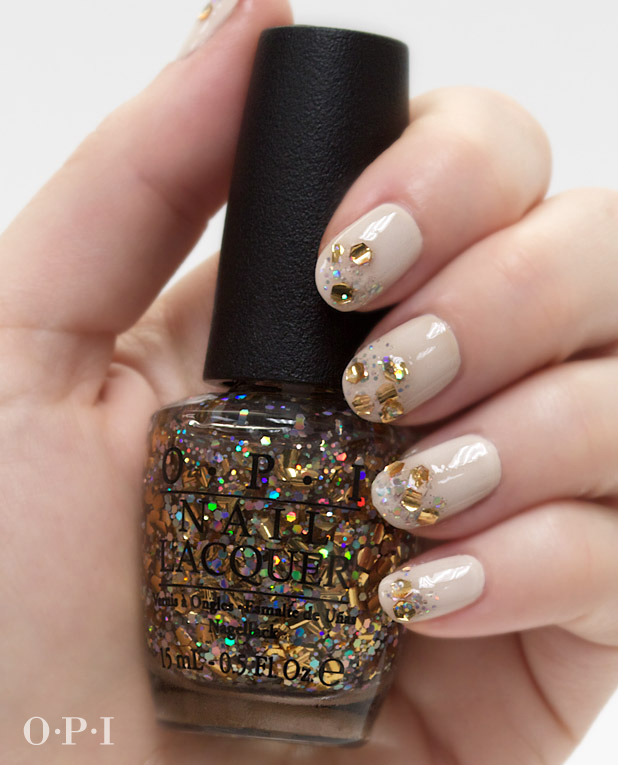 The glitter is smaller and spreads out more evenly on the nail, and the matte doesn't look cracked dried out as it tends to on the Liquid Sands. They application is really smooth, and when they dry, the matte just makes them sparkle like crazy! Did you ever get a chance to thin out Lights of Emerald City? If you did... did it help? the I Theadore You and Lights of Emerald City as a combo were lemming for me... and now that I have them I could not get the finish I wanted. These were my first purchase with OPI,I was a little disappointed. I got the Its My Year from the Miss Universe collection (2011) and that applied like a dream!